As I have been trying to use up a lot of my fabric, somehow it keeps coming in! I trained my husband recently to forgo jewelry in exchange for fabric and he surprised me with "flowers" for Valentine's Day- the three orange/blue Anthology fabrics on the left (gorgeous prints bytheway - I think Anthology fabrics are grossly overlooked by the bloggy world but they are to die for!) Next, a nice swap came from a swappy friend online - somehow I think that I am obsessed with orange lately. 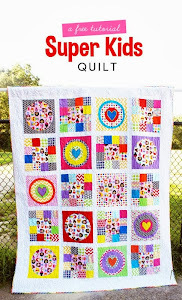 Finally, I got some backing for my Tufted Tweets Quilt (could it match more perfectly!?) on my recent semi-annual trip to Marden's. To my disappointment, they recently raised their prices from 2.99 a yard to 3.99 and up. The fabric is still a steal and it is hard to match a quilt top to an appropriate backing if you are shopping online (unless you buy a print that is in the top of course). I am now onto the final stage of completing this beast - just hand-sewing the binding down. I will show more pictures once it is complete. I made this skirt last week but delayed in posting about it because I wasn't sure if I liked it. I bought the orange Far Far Away II print with a coupon, otherwise this would've been one really pricey skirt. I wasn't thrilled with it initially because I just wasn't sold on the mustardy-flower Weekends trim that I had included, but it's grown on me and ripping it out would mean too much seam-ripping. When I get a chance to wear it, I will post another picture. 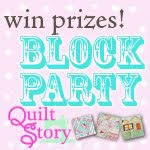 So I decided to enter two more blocks into the Quilt Story Block Party contest - the first in the "creative category" and the second in "traditional." For the NEMQG bee, Aimee asked for butterfly blocks. I adored the fabrics she sent and only ended up adding the KJR posie as a border from my stash. I may make another block for her if I can stretch the muslin she included. I used a tutorial found here, from the Four Wise Monkeys blog. Finally, here is the fifth block for the Blogger's Palooza. The 24 flying geese units about drove me up the wall. This whole quilt along is based on various person's use of flying geese and nine-patch blocks - so I am really hoping that some of the blocks focus on the nine-patch a little more! Sorry for the repeat of a project - but this is the baby I have been working on lately. Over the weekend I managed to sew up the reamining 13 dresden plates but have only appliqued one onto a background square. This block was created by using Darlene Zimmerman's Easy Dresden ruler, a compass to create the 7" circle template, and I used Anna Maria Horner's "super circle technique" to apply the circle onto the plate/background. All 30 dresden plates are done now! It was no small task! At first, I was taking a digital picture of the layout of the fans and then sewing it together exactly as I had had it layed out. It wasn't long before I realized that I needed to do this more quickly and I just randomly chained pieced the units together in groups of five. I am entering this block into the Block Party contest. Wish me luck! On Thursday I was able to complete block #4 in the quilt-along and clean up my house, all during Gregory's nap (boo-hoo, "nap" in singular form - he has given up the second nap now). This block was one of the easiest ones for me and I like it especially for being able to use a large scale print. I made those quick-change trousers from Anna Maria Horner's Handmade Beginnings book. These pants are SO fun to make: it's not the end of the world if your seam allowance is a little off, you get two "looks" per each pair of pants, it's really fun to put all of the fabric combinations together, and they do not take long at all to make. I couldn't believe how well the bird print went with the whales! Here's a picture of how they look by my favorite "model." Today I am going to make three pairs of the AMH pattern "Quick Change Trousers" for Gregory. I pulled out some oldies from my stash as well as a recent swap and some pieces from my haul with Sew Fresh. I decided I better make these soon because my son is growing so fast and the 24 mos size he is wearing now is none too big (he is almost 16 months). I think I have a good chance of getting a lot of sewing done today because the Air Force base is closed due to snow - another paid day off for my hubby! This is the only good thing about these constant snowstorms- I think I have gained about 10 lbs and am tempted, more than usual, to buy fabric online. Can someone say cabin fever? This picture was taken yesterday in our backyard. I took inventory of my completed quilts last night - I have seven with no immediate purpose - most of them baby size. I finished four of these in the month of January! I calculated how many dresden plates I needed for my African heart quilt - I needed 600. I am now in the process of snipping the corners, inverting them with a chopstick, and ironing them flat. I keep telling myself, "To be a quilter, one must be okay with repetition." What does one do with a 4 yd piece of slightly aged (dusty and wrinkled) flannel they bought at a yard sale this past summer? Why make a design board in their kitchen/sewing area of course! I am seriously loving it. We are running out of space in our apartment and all these piles of blocks had no home - so it was a great solution. Here is block #3 of the Blogger's Blockapalooza. I finally perfected my 1/4" seam and fixed the first block too. I finished this Blogger's Palooza block about a week ago. It has 81 tiny 2" squares. It came out nice looking but I don't think I want to tackle this kind of block again. 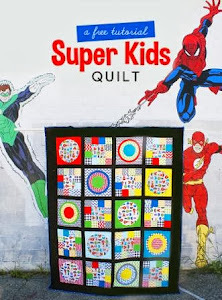 My dreams of doing this quilt are over. I also finished this "UFO" a week ago. I now have only 6 quilt tops left to be quilted. I have allowed myself to start some "newer" projects now that I have caught up on so many of them. It feels so good to get these off of the "to do" list and it has been great practice in doing free motion quilting. I did "cross-over" stipping on this. Pretty easy pattern but difficult to keep the "scale" consistent. I backed it with a piece of Timeless Treasures banana fabric I had bought at a quilting yard sale over one year ago. My nephew has a twin to this blanket - I had made too many blocks and thus had an "extra" quilt top. Thanks for reading this long - I thought about trying to split these pictures into different posts but decided if I didn't write too much - you would stay with me. Happy sewing!